This whisky is matured in the finest Mizunara oak casks. Our pioneering research into the effect of wood selection on whisky maturation has led to the development of bespoke barrels, crafted from slow growth, air-seasoned wood from hand-selected trees. These casks are handmade due to Mizunara oaks delicate wood grain. This spirit is gently matured in traditional style for many years before it embarks on its unique sea voyage. Mizunara oak casks are the most expensive casks in the world. Ariake cooperage in Kyoto Japan. 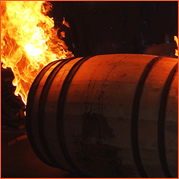 The use of mizunara oak for whisky barrels was not what one would declare serendipitous, at least not in its early years. 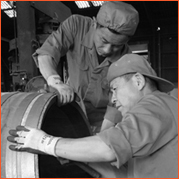 During World War II, Japan, like several other countries, was unable to receive imported goods, making the delivery of European or American oak barrels for whisky maturation impossible. Though it was not a priority to produce whisky, the demand for it increased greatly during this time period and became the primary drink consumed by the Japanese army. With this, Japanese coopers and whisky makers sought a domestic alternative to mature whisky in and found it in Japanese oak, more popularly identified as mizunara oak, which had been used in the craftsmanship of exclusive, luxury furniture. Mizunara oak for casks however, did not come without its own difficulties and obstacles. Time and supply was a great factor as a Japanese oak tree has to be at least 200 years old before it is a proper size to create a cask; a tree of this size and age was indeed a rare commodity. The shape of the tree also proved a hindrance as the oak trees do not grow straight but rather with a fluid curvature. Japanese oaks also possess less tyloses and more knots than European or American oaks increasing the difficulty to cooper watertight. As the oak is soft and thereby more difficult to shape, it is obviously more susceptible to leakage and prone to damage. The vulnerability to leaking is further aggravated by the naturally high moisture content Japanese oak has in comparison to its other oak cousins. Its name speaks for its incredible permeability: mizu, meaning water and nara, meaning oak, and hence added to the Japanese coopers and whisky creators’ lack of enthusiasm in the Japanese oak. Manufacturing the mizunara oak casks were not the only dilemma whisky makers faced; with whiskies being aged only a few years during the war time period, the flavor mizunara oak casks infused into the whisky provided a rather unwelcome surprise to whisky drinkers – an explosion of an intense, overbearing woodiness onto the palate. As a result, Japanese oak was snubbed and deemed substandard to American and European white oaks until further studies were done of longer maturation and finishing. Mizunara Oak is now regarded as the finest vessel to mature whisky. 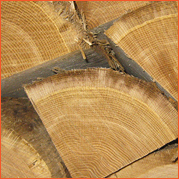 What makes mizunara oak distinct from European oak and White oak? For one, it enjoys a unique sweet and spicy flavor profile which can be attributed to the oak lactones ratio and high level of vanilla. Aromas evoked from the mizunara oak are kara, a type of oriental incense, sandalwood, and coconut. Research studies have shown that mizunara matured whisky contain more lactones (parts per million) than whiskies matured in either European oak or White oak. 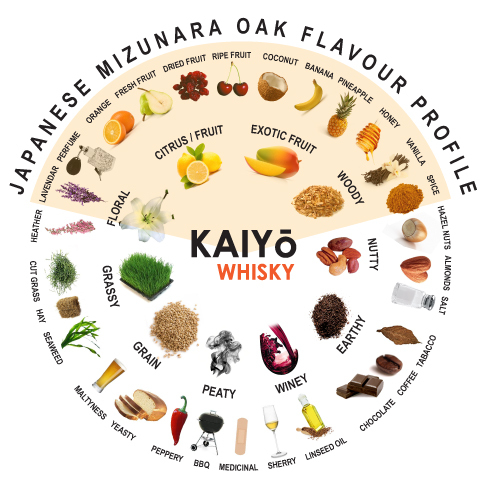 An even more riveting discovery was the prevalence of “trans-oak” lactones in Mizunara whisky. This was a remarkable find as it was thought that “cis-oak” lactones can possess a smell up to ten times stronger than “trans-oak” lactones. Time was a crucial ingredient previously omitted in mizunara oak matured whiskies making another distinction from European and White oak. Many suggest that a whisky needs to mature in order to truly experience the infusion of mizunara oak’s distinct flavors and aromas. It is perhaps a bit of Mother Nature’s work and serendipity that the mysterious spirit and character of mizunara oak was exposed. Today it is not only appreciated but revered and valued for its rarity and luxuriousness.